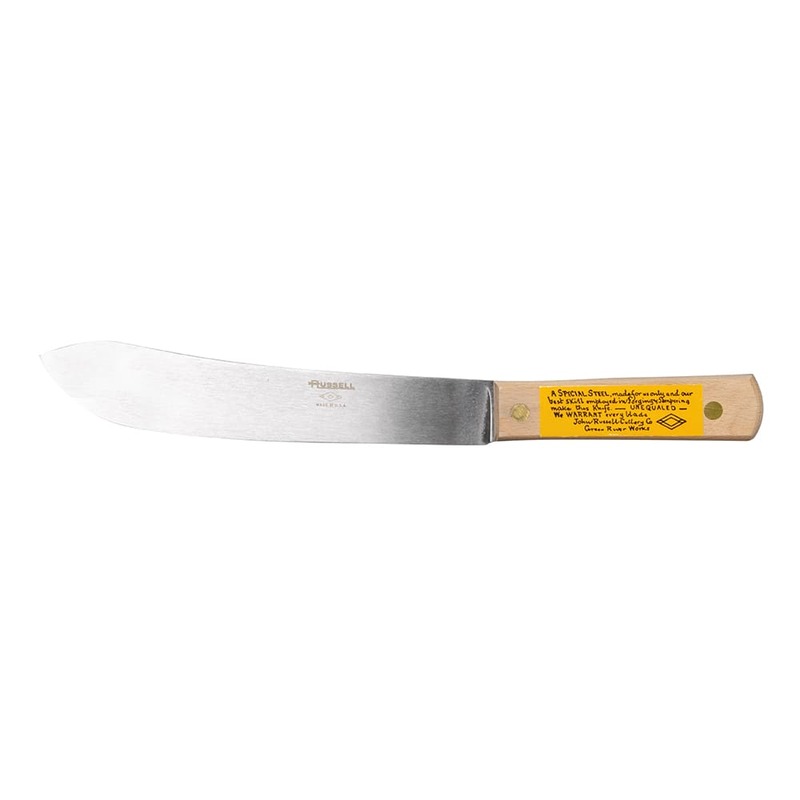 The Dexter 012-12BU 04641 butcher knife has a high-carbon steel blade that can be used for trimming, cutting, dicing, and cubing meats. The edge of the blade is individually ground and honed, ensuring it is extremely sharp out of the box. With the beech wood handle, the knife has a traditional appearance that works well in upscale establishments. The handle is secured to the blade with brass compression rivets that expand and contract with the wood to ensure it doesn't loosen. Measuring 171⁄4 inches long, the Dexter 012-12BU 04641 butcher knife has a 12-inch blade and 51⁄4-inch handle. "KNIFE IS MUCH MORE THAN ADVERTISED. THIS IS A WORKING KNIFE MEANT TO BE USED AND PROPERLY CARED FOR. IT CAME RAZOR SHAPE AND WILL BE EASY TO MAIN..."
"Fit and finish, and most importantly, the blade grind are excellent. This is a high carbon steel knife - therefore it must be washed and dried by..."
"KNIFE IS MUCH MORE THAN ADVERTISED. THIS IS A WORKING KNIFE MEANT TO BE USED AND PROPERLY CARED FOR. IT CAME RAZOR SHAPE AND WILL BE EASY TO MAINTAIN THE EDGE. BUYERS SHOULD KNOW THAT CARE OF CARBON STEEL BLADES IS MANDATORY. A PLEASURE TO USE. I'M CERTAIN THIS KNIFE WILL BE PASSED ON TO FAMILY MEMBERS (WHEN THE TIME COMES)." "Fit and finish, and most importantly, the blade grind are excellent. This is a high carbon steel knife - therefore it must be washed and dried by hand (never in the dishwasher !) immediately after use. A thin film of vegetable oil or food-grade mineral oil may be applied to the blade if you won't be using it again soon. Upon receipt of the knife I lightly sanded the wood handles and treated with boiled linseed oil, letting it cure for a week before use. The blade's edge was ground evenly at the factory, and arrived sharp. Knives made of this excellent steel are easier to sharpen than stainless steel ones, and are well worth the little extra care needed. 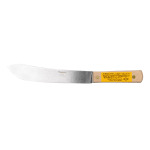 I find this 12 inch blade great for spatchcocking (removing the backbone), of chickens and turkeys before grilling. Finally, compare the price of this knife to what bbqpitboys charge for an old hickory knife. My grandkids will be using this knife decades from now !"